Thanks to generous support from the Summer Experience Fund I am able to participate in a Fellowship program with Global Action to Prevent War and Armed Conflict– a consultative, “watchdog” non-governmental organization (NGO). Global Action is based out of the United Nations Headquarters in New York City. As a Fellow under Dr. Robert Zuber’s guidance I am encouraged to observe and think critically about international politics and multi-lateral decision-making. 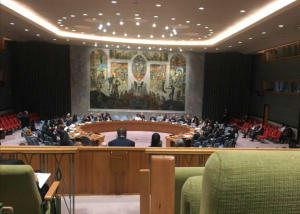 It is a privilege to have access to high-profile meetings and events within each organ of the UN organization – the Secretariat, the Security Council, the Economic and Social Council, the International Law Commission, the Trusteeship and the General Assembly. Broadly, the UN is charged with providing assistance and aid to international entities in need. As the allocation of financial resources remains at the heart of the institution, majority of the meetings are grounded in diplomatic compliance to overcome systemic challenges. Issues related to the success of peacekeeping projects and the promotion of political and economic stability is at the forefront of UN priorities. Global Action oversees the effectiveness of international law and policy implementation. Most notably, however, through publications, consultations and policy recommendations the think tank is designed to hold member-states accountable for their commitment to UN mandates and achievement of the 2030 Sustainable Development Goals. This summer I have wholeheartedly embraced the rooms where history is made. The political and socio-economic futures of Yemen, South Sedan, Colombia and Myanmar for example depend on the decisions made within this institution and it is an honor to be an observer. My attendance is required for a wide range of major meetings, side events, conferences and consultative meetings. During these critical meetings and events I’m able to witness how member-states respond to violations of international humanitarian law and the maintain global peace and security. Careful notation and administrative support is at the core of my responsibilities as a Fellow. I have also utilized this opportunity to practice my writing and formulate opinions on global disorder and international diplomacy. 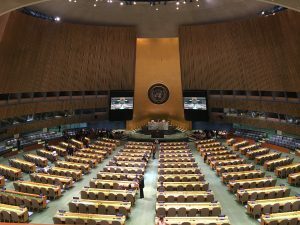 The increasing prominence of income inequality, mass migration, opportunities for corruption and climate-related issues has fostered an environment of anxiety and urgency within each UN chapter. I have developed an understanding of my generation’s responsibility to confront all current and impending challenges. Moving forward I am eager to adapt this invaluable experience to field specialization. I have gained a deep interest in urban/regional planning, climate-related resiliency, and public policy. Obtaining an advanced degree is definitely a priority and I will continue to consider a law degree as a sensible option for me. As a student of history and political science the opportunity to participate within a major international organization is a dream come true. Although criticism of the United Nations is widespread and seldom reasonable I am grateful to have a chance to witness any and all structural shortcomings first hand. My time at the UN has been emotionally and intellectually challenging and I am forever grateful for the ways my degree has prepared me to be resilient in my creative and critical-thinking capacities. I firmly believe in the importance of the United Nations as an institution and I am looking forward to exploring this fundamental space. I am excited to announce that I have been invited to San Salvador, El Salvador in January to help Global Action sponsor a commemorative celebration for the country’s politically active indigenous community. Opportunities like these inspire me to continue my work with Global Action. I intend to carry out my Fellowship into the Spring for there is too much to explore within this environment. I encourage all students to take full advantage of the opportunities provided by Skidmore’s Career Development Center. I am indebted to all of the support the CDC has shown me throughout my four years at Skidmore.